Apparently, the Japanese really like pretending to be cowboys. It seems to be a widely-held axiom in the games industry that while Japanese-made games and hardware can succeed in the West, the reverse is far from true. The Xbox 360 has faced notorious difficulty gaining traction in Japan, and last winter Square-Enix boss-man Yoichi "Imperial Hot" Wada publicly lambasted Japanese retailers and gamers alike for their anti-Western bias. Anti-Western bias, perhaps - but that doesn't mean Japanese gamers can't enjoy pretending to be cowboys. 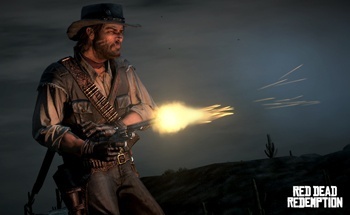 Following its recent debut, Red Dead Redemption entered the Japanese all-format retail charts at #4 (PS3) and #7 (Xbox 360), selling 70,599 and 25,673 copies, respectively. It may not sound like much, and it doesn't quite match Grand Theft Auto IV's November 2008 high-mark of 160,000 copies, but it's a damn nice showing for a Western-made title. The other new releases on the chart were Square-Enix's DS title Kingdom Hearts Re:Coded, which entered the list at #3, and F1 2010 (PS3) that debuted at #8. The number one spot, of course, was still Nintendo's Pokemon Black & White, which has moved a phenomenal 3,992,855 units since its launch last month. As impressive as this showing is for a Western title in Japan, it's really a drop in the bucket overall - Rockstar says that Red Dead Redemption has sold 6.9 million copies around the world.